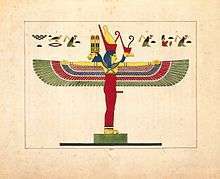 In one of his many forms, Ra, god of the sun, has the head of a falcon and the sun-disk resting on his head. Ra (/rɑː/; Egyptian: Rꜥ, Rˤ) or Re (/reɪ/; Coptic: ⲣⲏ, Rē) is the ancient Egyptian sun god. By the Fifth Dynasty in the 25th and 24th centuries BC, he had become a major god in ancient Egyptian religion, identified primarily with the noon sun. In later Egyptian dynastic times, Ra was merged with the god Horus, as Ra-Horakhty ("Ra, who is Horus of the Two Horizons"). He was believed to rule in all parts of the created world: the sky, the earth, and the underworld. He was associated with the falcon or hawk. When in the New Kingdom the god Amun rose to prominence he was fused with Ra as Amun-Ra. 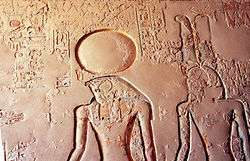 During the Amarna Period, Akhenaten suppressed the cult of Ra in favor of another solar deity, the Aten, the deified solar disc, but after the death of Akhenaten the cult of Ra was restored. All forms of life were believed to have been created by Ra, who called each of them into existence by speaking their secret names. Alternatively man was created from Ra's tears and sweat, hence the Egyptians call themselves the "Cattle of Ra." In the myth of the Celestial Cow it is recounted how mankind plotted against Ra and how he sent his eye as the goddess Sekhmet to punish them. When she became bloodthirsty she was pacified by drinking beer mixed with red dye. To the Egyptians, the sun represented light, warmth, and growth. This made the sun deity very important, as the sun was seen as the ruler of all that he created. The sun disk was either seen as the body or eye of Ra. Ra was the father of Shu and Tefnut, whom he created. Shu was the god of the wind, and Tefnut was the goddess of the rain. Sekhmet was the Eye of Ra and was created by the fire in Ra's eye. She was a violent lioness. Ra was thought to travel on two solar boats called the Mandjet (the Boat of Millions of Years), or morning boat, and the Mesektet, or evening/night boat. These boats took him on his journey through the sky and the Duat, the literal underworld of Egypt. While Ra was on the Mesektet, he was in his ram-headed form. When Ra traveled in his sun boat, he was accompanied by various other deities including Sia (perception) and Hu (command), as well as Heka (magic power). Sometimes, members of the Ennead helped him on his journey, including Set, who overcame the serpent Apophis, and Mehen, who defended against the monsters of the underworld. When Ra was in the underworld, he would visit all of his various forms. When Ra was in the underworld, he merged with Osiris, the god of the dead, and through it became the god of the dead as well. Ra was represented in a variety of forms. The most usual form was a man with the head of a hawk and a solar disk on top and a coiled serpent around the disk. Other common forms are a man with the head of a beetle (in his form as Khepri), or a man with the head of a ram. Ra was also pictured as a full-bodied ram, beetle, phoenix, heron, serpent, bull, cat, or lion, among others. The chief cult center of Ra was Iunu, the "Place of Pillars", later known to the Greeks as Heliopolis (lit. "Sun City") and today located in the suburbs of Cairo. He was identified with the local sun god Atum. As Atum or Atum-Ra, he was reckoned the first being and the originator of the Ennead ("The Nine"), consisting of Shu and Tefnut, Geb and Nut, Osiris, Set, Isis and Nephthys. The holiday of 'The Receiving of Ra' was celebrated on May 26 in the Gregorian calendar. His local cult began to grow from roughly the second dynasty, establishing Ra as a sun deity. By the Fourth Dynasty, pharaohs were seen as Ra's manifestations on earth, referred to as "Sons of Ra". His worship increased massively in the Fifth Dynasty, when Ra became a state deity and pharaohs had specially aligned pyramids, obelisks, and solar temples built in his honor. The rulers of the Fifth Dynasty told their followers that they were sons of Ra himself and the wife of the high priest of Heliopolis. These pharaohs spent most of Egypt's money on sun temples. The first Pyramid Texts began to arise, giving Ra more and more significance in the journey of the pharaoh through the Underworld. During the Middle Kingdom era, Ra was increasingly affiliated and combined with other chief deities, especially Amun and Osiris. Ra on the Solar boat. At the time of the New Kingdom, the worship of Ra had become more complicated and grander. The walls of tombs were dedicated to extremely detailed texts that depicted Ra's journey through the underworld. Ra was said to carry the prayers and blessings of the living with the souls of the dead on the sun boat. The idea that Ra aged with the sun became more popular during the rise of the New Kingdom. The rise of Christianity in the Roman Empire put an end to the worship of Ra by the citizens of Egypt, and as Ra's popularity suddenly died out, the study of Ra became of purely academic interest even among the Egyptian priests. Amun was a member of the Ogdoad, representing creation energies with Amaunet, a very early patron of Thebes. He was believed to create via breath, and thus was identified with the wind rather than the sun. As the cults of Amun and Ra became increasingly popular in Upper and Lower Egypt respectively they were combined to create Amun-Ra, a solar creator god. It is hard to distinguish exactly when this combination happened, but references to Amun-Ra appeared in pyramid texts as early as the fifth dynasty. The most common belief is that Amun-Ra was invented as a new state deity by the Theban rulers of the New Kingdom to unite worshipers of Amun with the older cult of Ra around the 18th dynasty. Amun-Ra was given the official title "king of the gods" by worshippers, and images show the combined deity as a red-eyed man with a lion's head that had a surrounding solar disk. In later Egyptian mythology, Ra-Horakhty was more of a title or manifestation than a composite deity. It translates as "Ra (who is) Horus of the Horizons". It was intended to link Horakhty (as a sunrise-oriented aspect of Horus) to Ra. It has been suggested that Ra-Horakhty simply refers to the sun's journey from horizon to horizon as Ra, or that it means to show Ra as a symbolic deity of hope and rebirth. (See earlier section: Ra and the sun). Khepri was a scarab beetle who rolled up the sun in the mornings, and was sometimes seen as the morning manifestation of Ra. Similarly, the ram-headed god Khnum was also seen as the evening manifestation of Ra. The idea of different deities (or different aspects of Ra) ruling over different times of the day was fairly common, but variable. With Khepri and Khnum taking precedence over sunrise and sunset, Ra often was the representation of midday when the sun reached its peak at noon. Sometimes different aspects of Horus were used instead of Ra's aspects. Sekhmet is another daughter of Ra. Sekhmet was depicted as a lioness or large cat, and was an "eye of Ra", or an instrument of the sun god's vengeance. In one myth, Sekhmet was so filled with rage that Ra was forced to turn her into a cow so that she would not cause unnecessary harm. In another myth, Ra fears that mankind is plotting against him and sends Hathor (another daughter of Ra) to exterminate the human race. In the morning Sekhmet goes to finish the job and drinks what appears to be blood. It turns out to be red beer, and she is too intoxicated to finish the slaughter. Hathor is another daughter of Ra. When Ra feared that mankind was plotting against him, he sent Hathor as an "eye of Ra" to exterminate the human race, later sending Sekhmet to finish the job. In one myth, Hathor danced naked in front of Ra until he laughed to cure him of a fit of sulking. When Ra was without Hathor, he fell into a state of deep depression. Ptah is rarely mentioned in the literature of Old Kingdom pyramids. This is believed by some to be a result of the Ra-worshipping people of Heliopolis being the main writers of these inscriptions. Followers of Ra were known to be jealous of Ptah. While some believed that Ra is self-created, others believed that Ptah created him. Isis frequently schemed against Ra, as she wanted her son Horus to have the power. 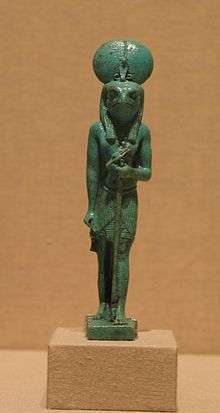 In one myth, Isis created a serpent to poison Ra and only gave him the antidote when he revealed his true name to her. Ra now feared Isis, as with his secret name revealed she could use all her power against him and have Horus take over the throne. Apep, also called Apophis, was the god of chaos and Ra's greatest enemy. He was said to lie just below the horizon line, trying to devour Ra as Ra descended into the underworld. As he swallowed Ra, this led to the setting of the sun and when he had completely swallowed Ra this led to nighttime. He never succeeded in completely swallowing Ra however as he eventually spit Ra back out, causing the sun to rise. 1 2 3 4 5 6 7 8 9 10 11 12 13 14 Hart, George (1986). A Dictionary of Egyptian Gods and Goddesses. London, England: Routledge & Kegan Paul Inc. pp. 179–182. ISBN 0-415-05909-7. 1 2 3 4 Hart, George (1986). A Dictionary of Egyptian Gods and Goddesses. London, England: Routledge & Kegan Paul Inc. pp. 172–178. ISBN 0-415-05909-7. ↑ Quirke, S. (2001). 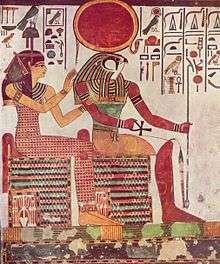 The cult of Ra: Sun-worship in ancient Egypt. New York: Thames and Hudson, p.144. ↑ Müller, M. (2002). Ra. In D. B. Redford (Ed. ), The ancient gods speak: A guide to Egyptian religion. New York: Oxford University Press, p.328. 1 2 Hart, George (1986). A Dictionary of Egyptian Gods and Goddesses. London, England: Routledge & Kegan Paul Inc. p. 6. ISBN 0-415-05909-7. ↑ Wilkinson, Richard (2003). The Complete Gods and Goddesses of Ancient Egypt. London: Thames and Hudson. p. 164. ISBN 978-0-500-05120-7. 1 2 3 4 Hart, George (1986). A Dictionary of Egyptian Gods and Goddesses. London, England: Routledge & Kegan Paul Inc. pp. 54–56. ISBN 0-415-05909-7. 1 2 3 4 5 6 7 Hart, George (1986). A Dictionary of Egyptian Gods and Goddesses. London, England: Routledge & Kegan Paul Inc. pp. 187–189. ISBN 0-415-05909-7. 1 2 Hart, George (1986). A Dictionary of Egyptian Gods and Goddesses. London, England: Routledge & Kegan Paul Inc. pp. 76–82. ISBN 0-415-05909-7. ↑ Harris, Geraldine (1981). Gods & Pharaohs from Egyptian Mythology. London, England: Eurobook Limited. p. 26. ISBN 0-87226-907-8. ↑ The World Almanac and Book of Facts 2011. p. 708. 1 2 3 Harris, Geraldine (1981). Gods & Pharaohs from Egyptian Mythology. London, England: Eurobook Limited. pp. 24–25. ISBN 0-87226-907-8.